The trek is over.... the team has arrived back in Lukla. With our goal of Lukla close at hand, we left Namche Bazaar early this morning for the 7 (or so) hour walk to Lukla. It was a big climb right at the finish, but we all arrived in pretty good shape and in good spirits. 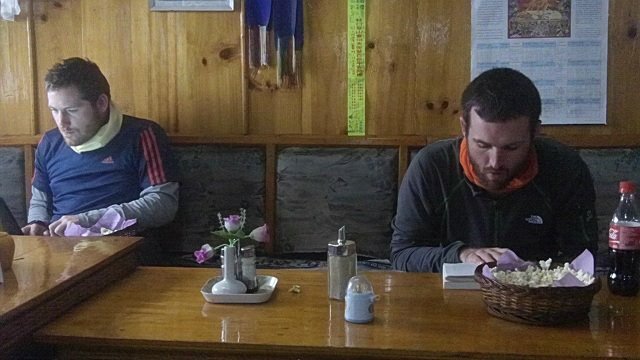 Below, Dr. Bryan Taylor and Alex Kasak enjoy some popcorn during "tea" at the lodge in Lukla. We have a flight scheduled for tomorrow morning to take us back to Kathmandu and the Yak and Yeti Hotel. Everyone is excited to sleep in a real bed again.